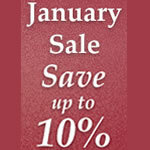 The January sales are in full swing and self catering holidays in the UK are no different with some great deals to be had even in this heavy booking time. You can find some great deals and offers on our website including 10% off luxury self catering in the south-west of England – Cornwall, Devon and Dorset. With a great selection of 5 star and 4 star cottages and apartments on the coast and in the countryside available with an extra 10% off it is definitely the time to book.